Download the New Catalogue Now! 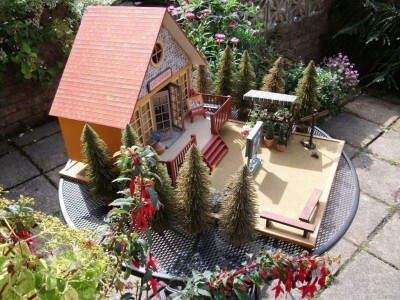 The NEW Dolls' House Emporium Catalogue can now be downloaded for FREE from the main dollshouse.com website. Need a hand downloading it? Head to the main dollshouse.com website and add the download to your basket. You'll need to complete an 'order' for the download, don't worry you won't be charged. Follow the process and you'll get a link to your downloads page. It is a large file (76mb) so it will take time to download but we know you'll enjoy it once you get it! If you encounter problems downloading the catalogue, please let us know the browser you are using, the time of day you have tried to download the catalogue and any software that you might be running in your browser such as ad-blockers or download checks. You can reach us sales@dollshouse.com. 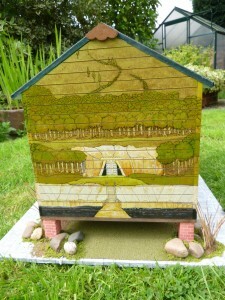 A woman whose possessions went into storage when she was ill in hospital and got sold off by accident has been reunited with one of her favourite heirlooms – her beloved dolls’ house. Daisy Phillips beat late stage cancer but found out about the error with her worldly goods only after being discharged from hospital. Her daughter Olivia told KGW, in Portland, Oregon, “I started crying, I couldn’t control myself, and we just held each other. “She has cancer and that’s a really scary thing and these are important family things that one day I wanted to give to my children." The online newspaper covered Daisy’s plight as she tried to track down her missing heirlooms. Then she got word that someone had located her special dolls' house, which had been inside the storage unit. 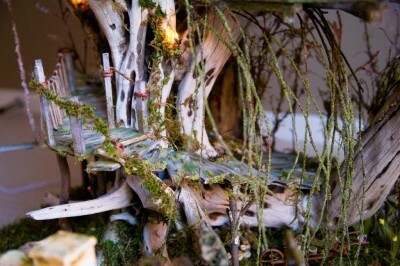 She had to buy the dollhouse back, at a cost of $500, but it she had it back and that's all that mattered. 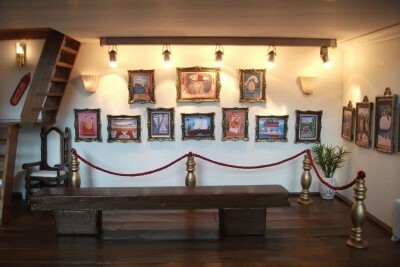 Click through for a video report and pictures of the treasured heirloom. Weighing in at an amazing 200 pounds and costing more than £13,000, this huge dolls’ house has 13 rooms over three storeys including five bedrooms, library, kitchen, dining room, marble hall and a utility room. You may have seen it in your local papers but the Daily Mail online has gone to town with some amazing photos. A remote controls the individually wired light switches, six of the 14 chimneys are linked to a smoke generator, both front and back doors have a doorbell, while in a modern twist, the home includes an iPad Nano which powers the speaker in the music room. Sarah Walkley, now aged 40, was five years old when she asked her father for the doll's house on Christmas Eve 1978. Thirty-five years later her dad has finally finished the job. 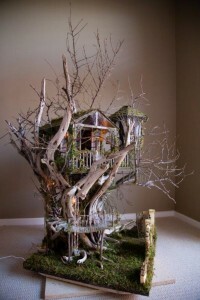 Dolls' house or real house? 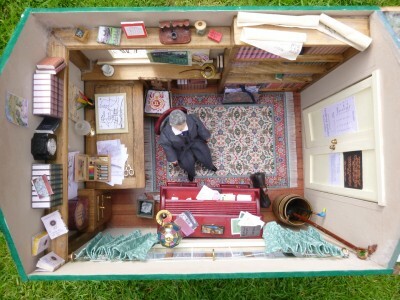 From time to time we bring you some amazing “real-life” dolls’ houses in this blog. 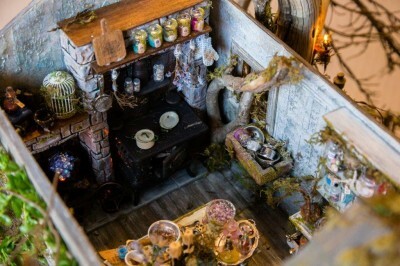 Click through to these pictures, and you’ll see a full-sized dolls’ house full of what looks like miniature furniture. But the bright colours and design fool the brain … these are actually full-scale furniture and accessories in a house that’s on the market for over £500,000 in Lydney, Gloucestershire. 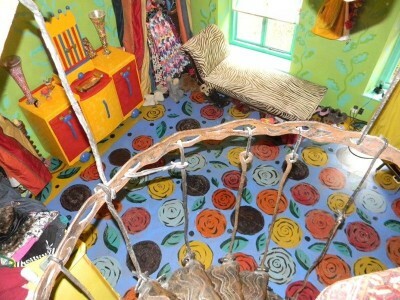 The entire cottage, including the toilet is decorated in bright, clashing colours. It was bought by an artist in the 1980s, and since then she has dedicated hours to transforming it. The estate agents' notes say: "A unique opportunity to purchase the home of the renowned contemporary ceramic artist, Mary Rose Young. Oak house was discovered by Mary Rose in the late 1980s and she has since carried out improvements and additions to suit her own inimitable style and sympathetically retaining many features relevant to its period. 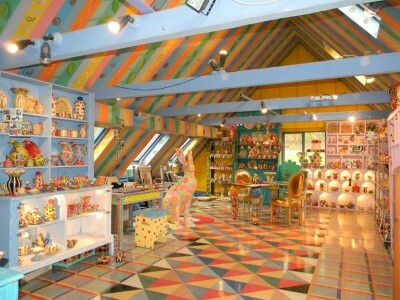 Mary Rose has decorated every surface of every room with vivid colours which reflect her style and bright and beautiful pottery."